1. Your ally is one of greatest on this qualification server. From which country are your members? Have you played the tournament before, alone or as a ally?? Have you preplanned this server? Our members are from Finland. No, this is my first tournament server. 2. What is your opinion about the status on the server? It’s pretty good. There are action like should be. I like very offensive playing. The status is pretty level. 3. What are your allys goal for this server? Do you have any opponents? Have you met any skilled players or alliances that you respect for the way they are playing? Our allys actually don’t have anykind goal on this server. We just play, have fun and what the most important, trying to survive to final. We have many opponents. There’s lot’s of denmark players and some sweden players which are war with us. Yes, there are lot’s of players which i respect and i would like to play with them on the final. 4. The russians was superior in the last Final. To defeat them you need to cooperate in a bigger group. Which of your opponents here would you like to see as a partner in the Final, or do you know about some from another domain? I am not aware of the previous final round but i think that we need to do play together with these Scandinavian players and keep together. In here, allys are going by country’s. Finland’s, Swedens’, Denmark’s and Norway’s. There’s some several players every ally who’s are very skilled. Russian is a big country so there will be lot’s of players. To win them we have to plan some ops and keep them in a tight around the round. That’s the way how we can win them. 5. Tell us something about yourself and your account? Male or female? How old are you? Where are you from? What do you do for your living? How long have you played this game? What do you do when not playing Travian? In here, our account start playing 3 guys. I have playing this game allmost 5 years, and there lot’s of servers on that time. We have played together many years so we know each other and work together well. We are everybody males and years 19,19 and 40. We are from Finland. When im not playing im working or spending time with my friends. This account is offensive account. 6. Anyting else you want to say? 1: We are all from DK, no we haven’t prepared anything. first time on scandinavian qual server. 2.What is your opinion about the status on the server? 2: Status are, that we are winning almost all gold medals every week… big time. We have had fun all along, but also used a lot of troops, unlike NO who has just simmed all server long, a little boring. have FIN into their knees and are waiting for the final battles about ww. 3: The goal is to have fun and why not try win the server, now we are here.It will be hard though. have been at war with FIN and semi war with SWE, almost all server. and NO are, as mentioned, just simming. so they should have an advantage. Respect to some FIN players, making the server fun. Like Pullukka who is now just a farm. but a really good player! With a greater ally behind him, he could have been a lot of trouble, looking forward to play with him in finals, i hope. 4: I would like all the scandinavian players to join a meta in the finals. That would even the odds a little, against threats like germans and russians. 5. Ilike to stay a little anonymous. Most know me as ch3353, but i have choosen to call myself z4t4nz in this round. Im danish, have played travian since start and in most countries. I was leader of the ally the that won the last danish speed server. I haven’t played there for about 5 years before that, since there are to few people i think. 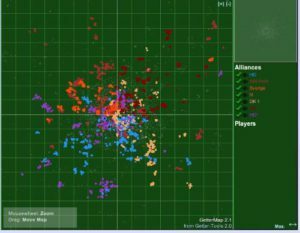 i realy miss x10 server (arcade or what they called it) that was aktionpacked! this x2 is a bit to slow i think. 6: This is just a play server, since all with 1 pop will qualify! so it’s a little hard, to motivate a lot of good gamers. The alliance Scramble have players from mainly Sweden, but also Norway, Finland, Denmark and Lithuania . The server are dominated by the Danish alliances, but also the Norwegians seems strong. The Norwegians are in a different area, so we haven’t been in much contact with them… maybe they are simming against ww? The Swedish alliances have ruined the chances for a Swedish ww victory by fighting each other . Most disappointing are the low number of players . Its also annoying that TG doesn’t fix the bugs in the game . The ally Scramble have no specific goals for this server anymore… not after the two Sw-Pow decleared war, and the ally Sverige joined them. Ofc. the war happened bec. of some stupid arty… doesn’t it always?? It annoys me that players are so unable to look at the whole picture instead of their own egos… that could end up beeing a big problem in the finale server… all those huge Nordic egos. There are some great players in most allys, we have some great players i our own ally as well. I would like to see all the Nordic country’s team up as a strong group before the final. I am from Norway, I’m 48 years old and I live some miles south of Oslo. I have played Travian for 4 years on lots of different servers. Me and my husband both plays, and normally we play on 2-3 different servers simultaneously. Always on speed servers. When I do not play I try to renovate my old house. We live in a old wooden house built in 1893, so it’s always some renovation to tend to. On the scandinavian server there is 3 metas participating in midgame. The Swedish meta with two bigger wings is in war with the other swedish group on the server.The same player have two WW. (SW-PoW, Sverige). The Norweigan is the outsider. They are said to have been simming all the server. Maybe they have a lot of huge armies hidden somewhere? The WW is hold by a player in a separate ally. Last post on the tournament forum was 16th May. No Report tread. From DK 1 a smaller group of players have settled in the Grey zone and taken all cropoasis there. Very few others have build in the Grey zone. Denmark and Sweden have settled along the border, Norway will have a long way with their support to WW. The swedes is divided, a controversity that began with the unique trainer who was conquered from one swedish ally by another. I have interviewed Scramble before and here you have the two other parts. Most of our members are swedish then we have some danish/norwegian guys aswell i think, im not entirely sure to be honest. All i know is that all of the people in our alliance is a happy bunch and play for fun. Most of the people in PoW played together on the last round on S2 and after EG the tournament server started and we basicly just decided to all start in the same corner of the map and se how far we could go. The server status is not that great. 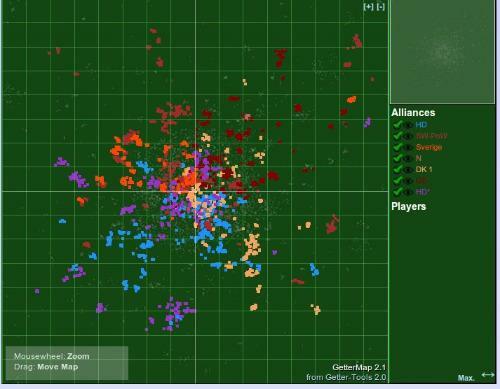 Too few players and in the start we had a ton of bots, and after the bot purging alot of people lost their farms. The danish seems coordinated and so does the norwegians, even though i havent seen any troops from the norwegians, probably shoudnt say that since theyll just visit me now:O. The Finnish looked strong but rumor is that they’ve got quite a beating the last month. The internal conflict still goes on. Some member of PoW left and formed the alliance Sverige but it didnt take long untill they were fighting with scramble again, so they are reallied with pow again. We entered the tournament server with the abition to atleast get to EG and be able to play in the finals, and now we have 2 WW. Our oppenents at the moment is the other swedes. Hopefully that conflict will be over when the finals start so we can team up with our fellow swedes, otherwise the danish and norwegians looks strong, but will we join up for the finals or not? and will we carry on old conflicts aswell into the finals? thats the questions and only time will tell what happens. As i mentioned before a scandinavian cooperation, maybe with country based alliances but under one meta. In the long run it doesnt really matter with wich country you team up with as long as you got the teamwork needed to prevail. I want people to remember that its just a game sometimes, ive seen some nasty namecallings and verbal abuse that isnt ok in some of the skype channels that isnt alliance specific. Such actions in real life isnt ok but when they happen over internet or in a chat its suddenly ok and if someone steps up and tells both sides to quit it just escalates. So remember people its just a game, and its meant to be fun! The ally Sverige consist of only of Swedish. I have not played on a tournament server before. The alliance Sverige emerged from the Sw-PoW confederation as a result of internal problems and disagreements. That means the alliance was not planned to exist at all. The server status is not good. Too few players and an immense problem with bots. The clearing of all the bots hit the server hard although it was needed. The HD alliances seem to be the strongest and the Finnish alliances seem to be defeated. Regarding the Swedish alliances it can only be said that the conflict rages on. The Sverige alliance was among other things created to avoid the war between Scramble and Sw-PoW. This worked out the first week or so but failed finally when Scramble did not stop further aggression at some of the members. This led members of Sverige to once again join the war against Scramble. To have fun and find people and alliances to work with in the final is our main objective. There are many skillful players on the server. To nominate one or a few as the best is impossible. We would prefer a Scandinavian cooperation. To succeed we need to focus on the final and less on what has happened on this server or on past servers. Other than that we will probably attempt to cooperate with a larger country in our area. I am male and 19 years old. I live in Sweden and have just finished upper secondary education (comparable to high school). My account Vilse i travian is played by three players all from Swedish speed. I am the least active on the account itself since I do not have time. I have played this game since 2006 so about 6 or 7 years. I do not have any specific hobbies. I think that if the Scandinavian server is to work together in the finals we do not only need to put the past behind uss but also behave. There are too many players whom get to personal in conflicts and begin to verbualy abuse and disparage other players not as players but as persons.